Riften lies on the eastern shore of Lake Honrich, in a region of the Rift known as the Smokefrost Peaks, and is surrounded by the expansive Fall Forest. Lake Honrich is one of the largest lakes in northern Tamriel, and is connected to the smaller Lake Geir in the northwest by the winding Treva River. In the center of Lake Honrich lies the Isle of Gold. Riften, as with the rest of the Rift, enjoys a relatively temperate climate compared to the other Old Holds thanks to the mountains of Ysgramor's Teeth, which separates the Rift from Eastmarch and the Sea of Ghosts, blocking the cold weather that comes from the north. One of the Standing Stones, the Shadow Stone, can be found overlooking the city from the southern gate. 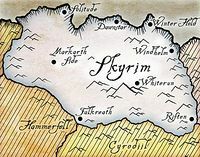 Much of the land surrounding Riften is farmland, such as the Merryfair Farm, the Snow-Shod Farm, and the Thornwell Farm, among others. Fort Greenwall serves an important bulwark against incursions from the north. Riften was also neighbored by several settlements, including Greenwall in the west, and Vernim Wood in the north. 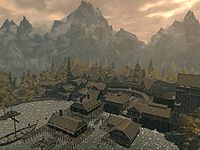 Riften's architecture and layout reflect the local environment and its role as a center of trade. In the Fourth Era, buildings are made of wood from the forest, and the heart of the city is its market square and dockyards, which together are known as the Plankside district. Plankside is separated from the rest of the city, Dryside, by a large canal with water-level entrances to lower quarters and a complex sewer system. These sewers, affectionately called The Ratway, are used as a refuge for the impoverished and outlaws, and also hold the headquarters of the Thieves Guild in Skyrim, who can trace their origins in Riften back to the Second Era. There is a Temple of Mara on the city's east side, a chapter of the Benevolence of Mara. Several noble families inhabited Riften, most notoriously the Black-Briar family, canny political manipulators who owned the Black-Briar Meadery. Another clan was the Snow-Shod family, who were staunch supporters of the Stormcloaks in the Skyrim Civil War. Mistveil Keep is the seat of the Jarl of Riften and contains the barracks of the city guard. In his youth, Prince Jorunn of Windhelm studied at Skald's Retreat on the Isle of Gold in Lake Honrich. When the Second Akaviri Invasion occurred in 2E 572, Jorunn and his closest comrades, the Pack of Bards, were in Riften when they received the news. They fought their way north to Windhelm, but were too late to stop the sacking of the city by the Snow Demons of Kamal and the slaying of Jorunn's mother and sister, Queen Mabjaarn Flame-Hair and Princess Nurnhilde. Jorunn barely escaped the sacking alive. After journeying to the Greybeards for aid and rallying the Nords of Eastern Skyrim, he claimed the title of Skald-King and amassed an army to defend Riften from the approaching Akaviri. Upon finding Riften heavily fortified, Ada'Soom Dir-Kamal decided to divert his army away from the city and towards Morrowind. 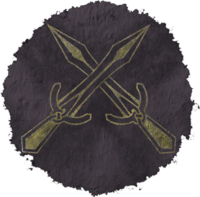 The Kamal were later defeated at a decisive battle in Stonefalls and an alliance known as the Ebonheart Pact was formed, with Jorunn leading the helm as the newly-crowned High King of Eastern Skyrim. Riften joined the Ebonheart Pact with the rest of Eastern Skyrim. During the Interregnum in 2E 582, the city of Riften was a small yet bustling mercantile hub. Riften suffered considerable damage in a conflict against the Order of the Black Worm that ravaged the Rift, and involved the Ebonheart Pact as well as the spirits of the Five Hundred Companions. Thallik Wormfather summoned the spirit of the giant chieftain Sinmur the Terrible, who then rampaged through Riften's northern wall and left nearby farmsteads in ruins on his way to Trolhetta. The city guard, under the command of Captain Viveka, tended to the damage, with an Agent of the Pact aiding the effort. Meanwhile, the Worm Cult unleashed zombies in the back alleys of Riften at the direction of the Anchorite Garmar, who possessed a shard of Wuuthrad that was needed to end Sinmur's threat. Once the situation in Riften was resolved, the Pact's army marched to Trolhetta while the Agent gathered more pieces of Wuuthrad across the Smokefrost Peaks. 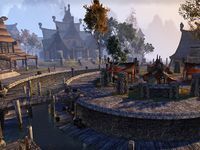 Around this time, the Thieves Guild began showing an interest in Riften, and an agent was sent to scout it and compile a report on its layout, merchants, and guard patrols. The city had a small sewer system used only as a "rat pathway" which the Guild believed would be expanded as Riften grew, and it was hoped that the tunnels could someday be utilized in their activities. This proved prescient, and by the Fourth Era, the enlarged sewers would become a den of criminal activity known as The Ratway. A cistern beneath the city had also been converted into an outlaws refuge, and was occupied by a gang of local Nords called the Skull-Brethren. In the early Third Era, the young Barenziah traveled to Riften and became acquainted with the Thieves Guild. On one fateful day, Barenziah and her guild associates attempted to rob the Imperial Commandment's building in the city. It was here that Symmachus re-encountered Barenziah and brought her back to Morrowind. During the Imperial Simulacrum in the late Third Era, the city of Riften was ruled by King Bjis, and had a rivalry with Windhelm. Riften continued to prosper well into the Fourth Era, when both its size and affluence reached their zenith. However, the city fell into a period of decline beginning in 4E 98, when the Jarl was assassinated. 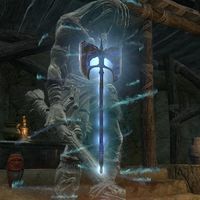 Hosgunn Crossed-Daggers was installed as the next Jarl of Riften, and although many believed Hosgunn was responsible for the previous Jarl's murder, he used the city guard to brutally quash any dissent and solidify his rule. Over the course of his long reign, the new Jarl imposed strict curfews, harsh punishments, and unreasonably high taxes on the people, spending most of the accrued gold on the construction of a massive and lavish wooden castle for himself. As Riften sank into squalor and its people succumbed to disease and famine, the city finally reached its breaking point and a popular revolt broke out in 4E 129. Hosgunn's castle, by then derisively known as "Hosgunn's Folly", was set alight, creating a conflagration that quickly consumed the entire city. Although Jarl Hosgunn's tyranny was brought to an end that night, many citizens perished, and Riften was left in ruins. The city was rebuilt over the next five years into a smaller, gloomy, fortress-like town of wooden structures and rough stonework, which it remained as of 4E 201. During the Skyrim Civil War in 4E 201, Riften and the Rift were affiliated with the Stormcloaks, the rebel group that sought to split Skyrim from the Third Empire and crown Ulfric Stormcloak as High King of Skyrim. Laila Law-Giver was the Jarl of Riften at the time, and despite aligning with Ulfric, she was not fully convinced by the Stormcloak cause or Ulfric's leadership. The Snow-Shod clan avidly supported the Stormcloaks, while the Black-Briars were friendly to the Empire. Meanwhile, the Thieves Guild was experiencing a long streak of misfortune that had resulted in the loss of much of its influence in Skyrim. There were many theories about their sudden downfall, but the troubles began after Guildmaster Gallus Desidenius was killed in 4E 176 by one of his allies, Mercer Frey. During Gallus' time as the guildmaster, he maintained relationships with the influential families of Skyrim and kept the Thieves Guild's business safe across the province. With his death, the Thieves Guild had fallen into obscurity, but continued their alliance with the matriarch of the Black-Briar family, Maven Black-Briar. A new recruit eventually helped the Thieves Guild regain its lost glory, expose the murder of Gallus, and reassert itself throughout Skyrim. For game-specific information, see the Arena, Skyrim, and ESO articles. This page was last modified on 9 April 2019, at 14:30.